This pus-filled cavity is often caused by aspiration, which may occur during anesthesia, sedation, or unconsciousness from injury. Alcoholism is the most common condition predisposing to lung abscesses. Lung abscess is considered primary (60%) when it results from existing lung parenchymal process and is termed secondary when it complicates another process e.g. vascular emboli or follows rupture of extrapulmonary abscess into lung. Onset of symptoms is often gradual, but in necrotizing staphylococcal or gram-negative bacillary pneumonias patients can be acutely ill. Cough, fever with shivering, and night sweats are often present. Cough can be productive of foul smelling purulent mucus (≈70%) or less frequently with blood in one third of cases). Affected individuals may also complain of chest pain, shortness of breath, lethargy and other features of chronic illness. Those with a lung abscess are generally cachectic at presentation. Finger clubbing is present in one third of patients. Dental decay is common especially in alcoholics and children. On examination of the chest there will be features of consolidation such as localized dullness on percussion and bronchial breath sounds. Although rare in modern times, can include spread of infection to other lung segments, bronchiectasis, empyema, and bacteremia with metastatic infection such as brain abscess. Necrotizing tumors: 8% to 18% are due to neoplasms across all age groups, higher in older people; primary squamous carcinoma of the lung is the most common. In the post-antibiotic era pattern of frequency is changing. In older studies anaerobes were found in up to 90% cases but they are much less frequent now. Lung abscesses are often on one side and single involving posterior segments of the upper lobes and the apical segments of the lower lobes as these areas are gravity dependent when lying down. Presence of air-fluid levels implies rupture into the bronchial tree or rarely growth of gas forming organism. Raised inflammatory markers (high ESR, CRP) are common but nonspecific. Examination of the coughed up mucus is important in any lung infection and often reveals mixed bacterial flora. Transtracheal or transbronchial (via bronchoscopy) aspirates can also be cultured. Fiber optic bronchoscopy is often performed to exclude obstructive lesion; it also helps in bronchial drainage of pus. Pathology image of a lung abscess. Most cases respond to antibiotics and prognosis is usually excellent unless there is a debilitating underlying condition. Mortality from lung abscess alone is around 5% and is improving. ^ Bartlett JG, Finegold SM (1972). "Anaerobic pleuropulmonary infections". Medicine (Baltimore). 51 (6): 413–50. doi:10.1097/00005792-197211000-00001. PMID 4564416. ^ a b "Pneumonia and Other Pulmonary Infections: Lung Abscess, Medscape". Archived from the original on 2008-03-21. Retrieved 2007-06-20. ^ a b Moreira Jda S, Camargo Jde J, Felicetti JC, Goldenfun PR, Moreira AL, Porto Nda S (2006). 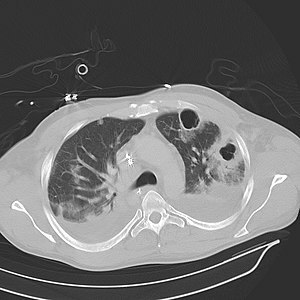 "Lung abscess: analysis of 252 consecutive cases diagnosed between 1968 and 2004". Jornal brasileiro de pneumologia : publicaça̋o oficial da Sociedade Brasileira de Pneumologia e Tisilogia. 32 (2): 136–43. PMID 17273583. ^ Tamparo, Carol (2011). Fifth Edition: Diseases of the Human Body. Philadelphia, PA: F. A. Davis Company. p. 367. ISBN 978-0-8036-2505-1. ^ Bartlett JG (2005). "The role of anaerobic bacteria in lung abscess". Clin. Infect. Dis. 40 (7): 923–5. doi:10.1086/428586. PMID 15824980. ^ Hirshberg B, Sklair-Levi M, Nir-Paz R, Ben-Sira L, Krivoruk V, Kramer MR (1999). "Factors predicting mortality of patients with lung abscess". Chest. 115 (3): 746–50. doi:10.1378/chest.115.3.746. PMID 10084487. This page was last edited on 20 February 2019, at 19:53 (UTC).